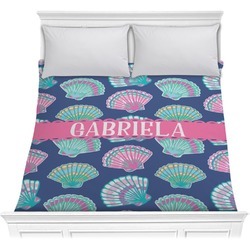 If you are looking for a luxurious custom made comforter, then you have come to the right place. Each one of our comforters are hand made with your custom design right here is the USA. Here at YouCustomizeIt, we have hundreds of different designs for you to choose from. Each design can be customized and personalized to your exact specification. You can also upload your own design and/or photos. If you have something specific in mind, contact us and we will try our best to accommodate you. The top of the comforters is a smooth minky fabric, while the back has 320 count sateen cotton (see close up photos) in coordinating black or white. The comforters are filled with a down alternative filling. 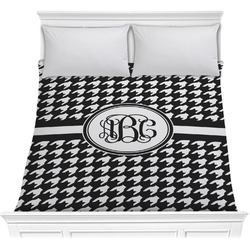 The minky comforter fabric is digitally printed; all the fabric is then cut and sewn to make your custom comforter. Please Note: The minky fabric is white before it is digitally printed with your design - and since minky has pile, dark colors like black will not print right down to the base of the fabric - so if you run your hand across the pile - you will be able to see the white underneath. I could not be happier! It is so soft and fits my bed perfectly! Colors and image are vivid and detailed not blurry! YouCustomizeIt is the best! The images provided weren't even the highest quality yet YouCustomizeIt managed to make them absolutely vivid and stunning. You can see every single detail of the image as well! Honestly the result came out better then I could've ever expected. And I didn't know what to expect using a new custom printing company but I could not be more amazed and happy with my choice of using YouCustomize it! Thanks YouCustomizeIt!